I’m in a ‘It’s my birthday so I can bake if I want to’ kind of mood, because it is my birthday, and I am baking! And I know that a classic birthday cake is a deliciously moist golden vanilla sponge with smooth and truffle like chocolate frosting, and about a pound of colorful sprinkles, but I think turning 25 has given me enough perspective on birthday cakes to feel that it’s ok if I don’t go through the trouble of making my cake (it is Ilmenau folks, so I did bake my own cake, and cut it 4 hours before my birthday so I can have it with a cup of coffee) with the whole frosting and sprinkle shebang. On a side note, it is july 4th, and blue and red always seem to creep up on this day, so if you want something to celebrate independence and not my birthday, then try these 4th of July Cupcakes. But let’s not kid ourselves here. Vanilla and chocolate must live on in harmony, birthday after birthday. 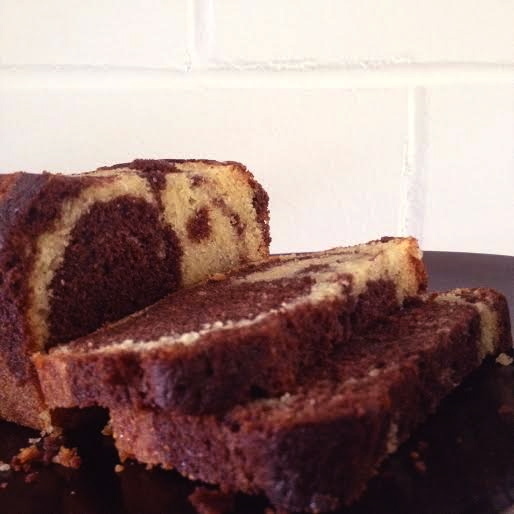 So I thought to myself, why not make my all time favorite marble cake, which is essentially a birthday cake rolled up into one gorgeous loaf of golden and decadent chocolate swirls. This recipe is fool proof and quite honestly the best one i’ve come across, and it’s been more than 10 years, so yes, it’s amazing. This recipe is the brilliant concoction of one of my favorite people, Mehak. I’ve been asking her to make this cake since 7th grade, and she never disappoints, so here’s a gift from me to you guys, because no one should have to live without this recipe. No one. In a large bowl whisk the butter and sugar. You can use only butter, but I like to add some oil instead of the butter because it just makes a better crumb. Whisk in the eggs, one at a time, until just combined. Then add the flour, salt and baking powder and fold until completely mixed in. Add the vanilla and milk. At this point you have two options. You can grab another bowl and divide the mixture, adding cocoa powder to one of them, or you can just dollop half of the batter into your baking tin, add the cocoa powder to the remaining batter, then dollop it over the vanilla. Obviously you’ll get a better swirl and marble effect if you use two bowls, dolloping the batter into the cake tin alternately, but if it’s just for you, to enjoy with a cup of tea or coffee, i’d stick to one bowl, as I always do. So that’s it, once you’ve added both the chocolate and vanilla mix to the cake tin, give it a few swirls with a tooth pick or knife and bake it for 40-45 minutes, or until a toothpick inserted into the center comes out clean. Baking time can vary according to the size/depth of your baking tin. If you use a loaf pan it will take longer, and the top will harden a bit, but don’t worry, because under the hard layer is moist heaven.